This Sunday, April 30, is National Animal Advocacy Day! We know many of you are fighting for stronger animal-protection laws all year long, but did you know that kids can make a big difference for our four-legged friends, too? From starting an animal club at school to attending lobby day with you at the state capitol, it’s never too early to get involved. In honor of this year’s National Animal Advocacy Day, check out these fun and easy tips to help the little animal-lovers in your life get started on being the best, strongest voices for animals possible—this Sunday and for years to come. 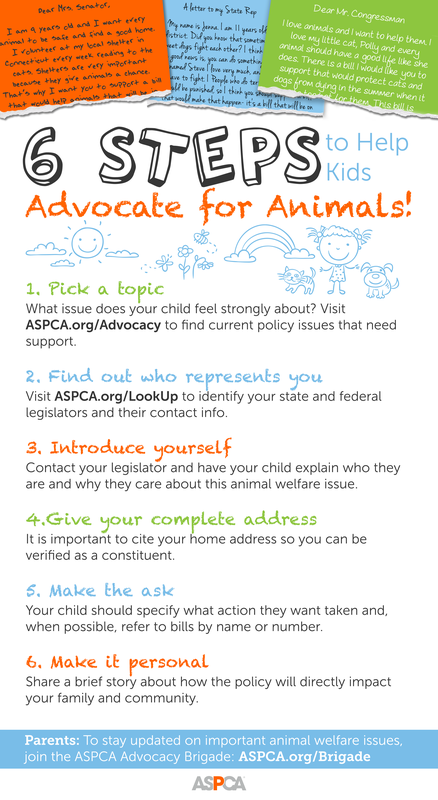 Be sure to share the above graphic with your friends and family on your social networks, then visit the ASPCA Advocacy Center for ways you and your kids can take action right away for animals across the country and in your state. Thanks for taking the time to make a difference for animals this National Animal Advocacy Day!